I wanted to try this restaurant for ages, and since this morning I went hiking and it was still 9am when i came back to Xinyi, i decided to have my breakfast there. I picked pancakes, because the hot weather reminded Thailand, and for me, Thailand+ breakfast means pancakes (maybe weird, this that’s like this). So i chose the season fruit pancakes and a banana yogourt drink (Thailand all the way). I didn’t expect it, but it was huge! 3 pancakes, the size on an omelette, some whipped butter, a lot of fruits (that i loved it) and some syrup. The syrup cup was pretty small, and i only found out in the end that you could refill it, but anyway, it was nice. The only thing is that pancakes are heavy so maybe it would be better to choose fruits that make juice to make it easier to eat. I had to force myself to finish it and actually this made my br-un-er. So maybe reduce the size to 2 pancakes would also be cool for a breakfast.It’s not that cheap, it cost me 440NTD for the drink and the pancakes, but it’s like the average price in the area. Anyway, a nice adress for breakfast, in a nice environment, with music. I realy liked it. They also serve French toast, omelette, hamburgers, brownies, apple pies, smoothies, juices, coffee and tea, cocktails, american breakfast, potatoes….so you can nearly have whatever you want, except waffles. A xiaochi i tried for lunch. It’s rice filled with pork here, and the all is in a banana leaf. Lucky me, there were ants in mine. It’s quite heavy and oily and the meat was only fat. Not really good, but it can be good, i just need to find the right place to buy it. 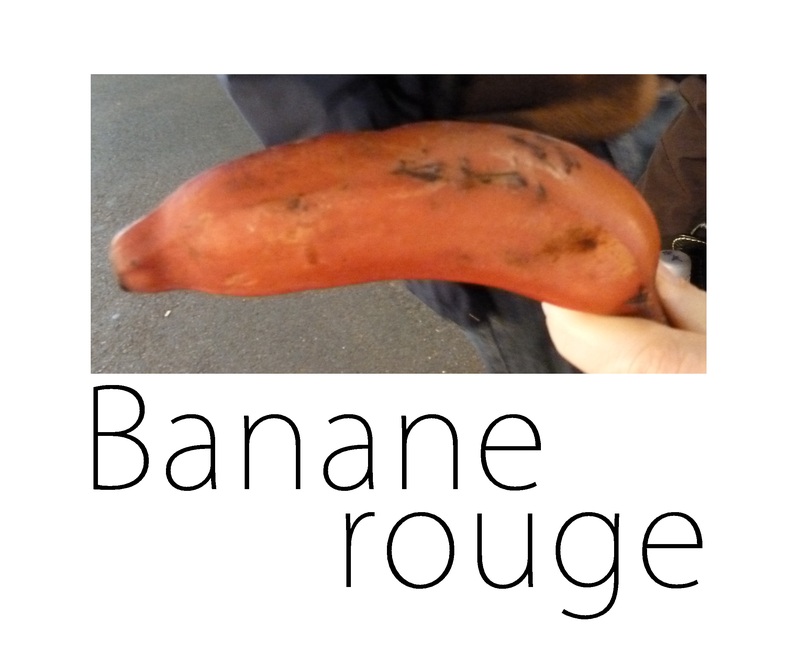 Another fruit, the red banana. I had seen one in Hong Kong 6 years ago, but i didn’t eat it. As i saw one a few days ago, i finally try it: even sweeter than the small ones, but that’s just a banana and the inside is as yellow as a plain one. Since today i finished my exam and wasn’t really happy about the Chinese one, i decided that i needed something sweet. And, lucky me, tiday is Thanksgiving day. So the “famous” pie seller around the university that usually only comes on Tuesday and Thursday from 3pm to 8pm stayed longer today. 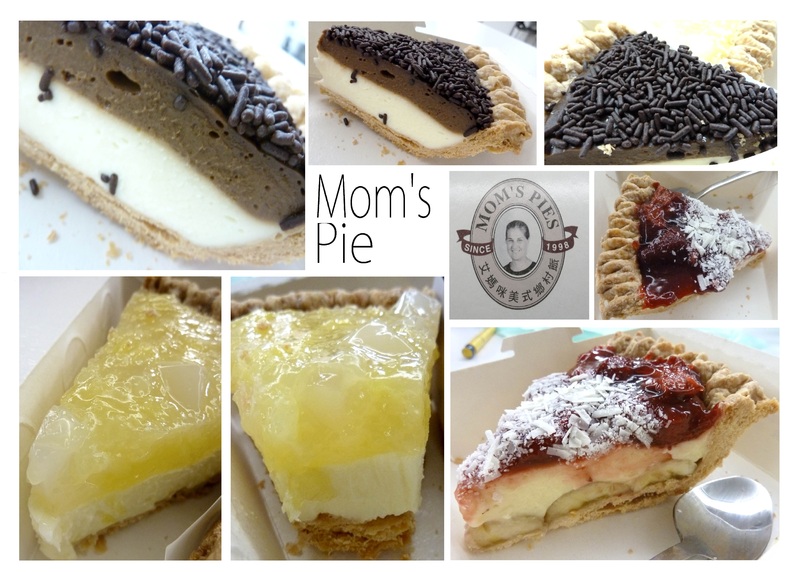 I was finally able to taste these pies that everyone talk about in the area and that taipei food blogs also know. I was then expecting much about these. I was quite disappointed. I chose 3 (i’ve been wanting to try them for 3 months now, so of course, i had to try several! ): Pinapple coconut cheesecake, coffee cheesecake and strawberry banana pie. I must say that was the first time that i remember eating a cheesecake (i ate once in NYC but i can’t remember the taste, so..). I think that i just don’t like the cake in itself, because both cheesecake weren’t that good. I mean, it’s easy, you can’t really taste the fruit or coffee flavors and i don’t really enjoy this texture that’s creamy but heavy and too much cheese flavor. That’s the cake in itself that i don’t like, so i can’t really judge it, since that’s also my first time eating one. However the strawberry banana pie was ok. Not exceptional though. I will not travel around the city to get one, and i don’t think i’ll buy another neither. I ate 3 and i was still hungry as if i hadn’t eaten anything! It’s still too “American like” dessert, which are usually not my cup of tea, except a few sweets. When you don’t have an oven, that you only have a knife and a micro-wave as tools to cook, you start to think really simply. I can’t even up the egg whites, so what dessert can i possibly do? And then you start to think. And then, what kind of easy desserts does my family do? Answer: Compote! – spices (i found something with called Imperial spices with cinnamon, anise, cumin, clove, spicy seasoning) i think you can use if for gingerbread too, maybe i’ll try during winter. Pealed and cut your apples in small pieces, do the same with your bananas, add the spicies as you like and put 10 minutes in the micro-waves. Then mix a little, and put around 8 minutes again in the micro waves. Ready to eat! You can have it hot or cold, as you prefer. 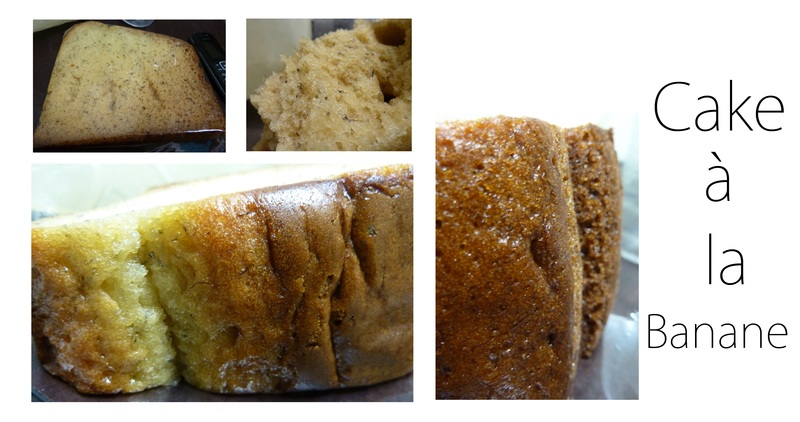 A banana cake i tried at the best of the two bakeries near NCCU. A little problem concerning the baking, but this was quite good. Since banana is cheap here (the cheapest fruit actually with clementines), there are a lot of Banana cakes. Today was another of my “fruit experience” day. I bought something i haven’t seen in my life before. When i first picked it, the seller told me that i couldn’t eat it right away, so i asked for a good one. Now i know how to pick it! But i still don’t know the name of this fruit, so i called it “pomme de pin” (pine cone), because that’s what it looks like (at least to what i can assimilate it with). To eat it, you have to remove the green things one by one, and then you’re left with some white things where you can find seeds inside. It took me about 30 minutes to eat it. That’s really long, but it’s good. But again, that must not be the right way to eat that because if it is, that’s quite horrible. This fruit is good, sweet and fresh, i also love it. I also tried some small bananas that are firmer than the one i usually eat. Quite good too. In fact so far all fruits are awesome.